The LiteConsole XPRS Mobile DJ Booth is a sleek portable DJ Stand, with it's new design making the system even easier to assemble. 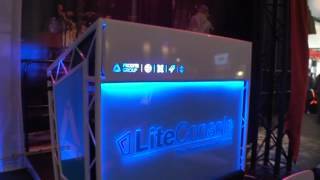 LiteConsole XPRS is a high-impact visual soluton for any mobile DJ or Club DJ Setup, also it can be used for AV presentations, exhibitions and conferences with it's eye-catching design. Considering purchasing the LiteConsole XPRS V2? Have questions? Ask people who've recently bought one. Do you own the LiteConsole XPRS V2? Why not write a review based on your experience with it. Would not recommend buying unless you want bad service! on the 28/06/16 we bought a liteconsole stand, cost us £1500 with extras added. when delivered we got the wrong cut of the gantry and had to send it back to you, so the first time we used it was on the 03/07/16. it was such an outstanding stand, spent a lot more money on printed perspex for the stand etc and i really loved its professional look not to mention it took us less than 3 minutes to pack the stand down! 2 months later/4 gigs use on the 10/09/16 it started to fall apart, £1,500 4 uses turned from a really nice stand to the worst stand to ever set up! the plastic boards kept unsticking from the metal frame and would just drop mid gig, not such a nice look! 3 minutes pack up time increased to 30 minutes, luckily we filmed and took photos of what we had to deal with. 3 months we had to put up with it (as we was extremely busy with gigs, plus we was very patient) in December we contacted liteconsole and they said someone would be intouch, we waited another month before i messaged the Liteconsole facebook page. from there they told me to email them, so i did, spoke to Alex and we was sent some sticky pads, GREAT! we fixed them to the stand which seemed to be working well until the end of april, they started to unstick again, it was bearable but not worth £1,500. i contacted them again and Nick personally came down himself to see what the matter was, i thought that was such a nice thing to do from a company and i appreciated he took time to solve the issue. However when he came down all he did was brag! and tell me we store them incorrectly, apparently YOU MUST lay the shelves down in and out of transit and when storing. it was either our fault, or he was bragging about his stands being in big shows etc. our van is quite big however there is no space in our house or van to lay it down. anyway he super glued the shelves back together and said that should be okay, we laid it flat just like he instructed and went to use it at the gig. when we took it in they all fell off! such an embarrassing moment! we tried sticking it back, it wont stick! Nick made it unusable!! from that moment we have tried to get in contact with him and he has had holidays and other events. we finally got a call to say there is nothing he can do we need to pay to get it fixed! me being angry and upset i went on their Facebook page, i set an angry face on a few of their posts and they blocked me from their page before i could say anything. I am extremely disappointed, i will be showing pictures and videos of it all falling apart! funny thing is we was thinking of buying a new LiteConsole stand and so was a few of our friends, safe to say we shall be looking elsewhere! Fantastic bit of kit, well thought out and easy to put up and down. My advice is to buy the seperate UDG Bag as wheeling it in and out is much easier than the seperate cloth bags. If I were to have s gripe, being 6 ft 2 my preferred mixing height would be a few inches higher but that's just personal opinion. Pricey but well worth it! Looks amazing, nice and sturdy even without the whole thing set up and plenty of space for gear on all the shelves. Solves a massive problem and is the best thing (or certainly for the cost) on the market right now. Fantastic piece of kit. Well worth the money. Only down side is very cheap and nasty bags. In my opinion a waste of time. Great product & it arrived quickly too..
Had this with light gantry for 3/4 weeks and couldn't be happier. Similar setup/pack up time to rhino stand with star cloth and tbar but looks 100% more professional. Shelves are heavy and the bags it comes with are terrible so worth investing in a flight case or heavy duty carry bag. I opted for a custom flight case. My one criticism is I brought it to put a 50" plasma in the front instead of the perspex but the brackets are discontinued and can't be sourced from anywhere resulting in having to buy an ultra short throw projector, rear projector film and another piece of perspex to customise it. Aside from that, the xprs is brilliant. I spent a lot of time 'umming' and 'ahing' about whether to purchase this. It is pricey and bearing in mind that you have to buy an uplight seperately (in my case, the ADJ Mega Bar), I couldn't justify it. Oh, and the added cost of branding and a flightcase! But then I decided to take the plunge and go for it and, to be honest, I am glad I did. It looks great (especially with the branding) and it is so easy to set up and take down. You'll need to buy a fightcase for it as the bags they come in aren't made to last. The UDG bag is the most available, but I didn't like it so I had a flightcase custome made. It's a lot classier than a star cloth and really gives of a professional look. I only have two real gripes with it. Firstly, the kick plate is plastic. For the amount of money that is spent on the LiteConsole itself, as well as all the extras that you need to spend to really fulfill it's potential, this was a disapointing, cheap part of the stand. Secondly, I have spent a lot of money on my light ands sound, yet the only thing that people notice is the LiteConsole. Not so much of a gripe, but still! I bought the Lilteconsole XPRS in black for use in my mobile DJ setup. I could not be happier! It's very professional looking and incredibly easy to put together. Has plenty of room for CDJS, mixer and a laptop as well as a lower shelf for storing cases etc. Looks even better with a wide angle wash panel on the lower shelf to light up the front and side perspex panels. Well worth the investment! A fantastic bit of kit! Ordered mine after seeing plenty about at BPM this year. The fact that you can make it your own by laser cutting the front piece of metal and/or getting the front facade it brilliant. Very sturdy and well worth getting the gantry for placing lighting on. I was sent the UDG Carry bag in error but having seen the bags that are sent with stand decided to keep it as it’s a far more practical way of carrying the stand about. Expensive but well worth the investment. 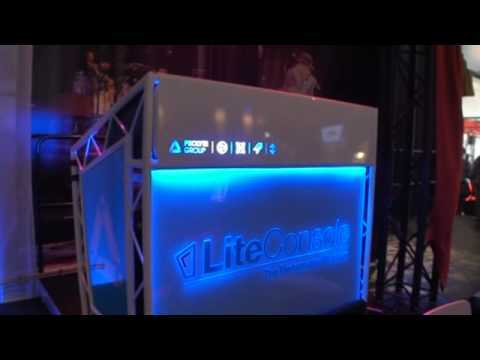 Seen a video for LiteConsole XPRS V2 online or have you own video? You will earn 2,088 loyalty points with this product worth £5.22, when logged in. Check out LiteConsole XPRS V2 on DJkit.com!